JEE Main 2019: Joint Entrance Exam (JEE) is a national level undergraduate entrance examination which acts as a gateway for admissions into various B.E/B.Tech programmes in India. Previously, the JEE Main exam was conducted by CBSE but from this year the JEE Main exam is conducted by NTA that is National Testing Agency. NTA has planned to conduct JEE Main exam twice a year that is the first attempt in the month of January and the second attempt in the month of April. JEE Main first attempt that is January session was conducted from 9th January to 12th January and the JEE Main results for January session was released on 19th January. So the students who are not satisfied with JEE Main January attempt can apply for JEE Main April attempt to improve their marks. In this article, we will provide you with all the details regarding JEE Main 2019 April Attempt. Read on to know everything about JEE Main April exam. 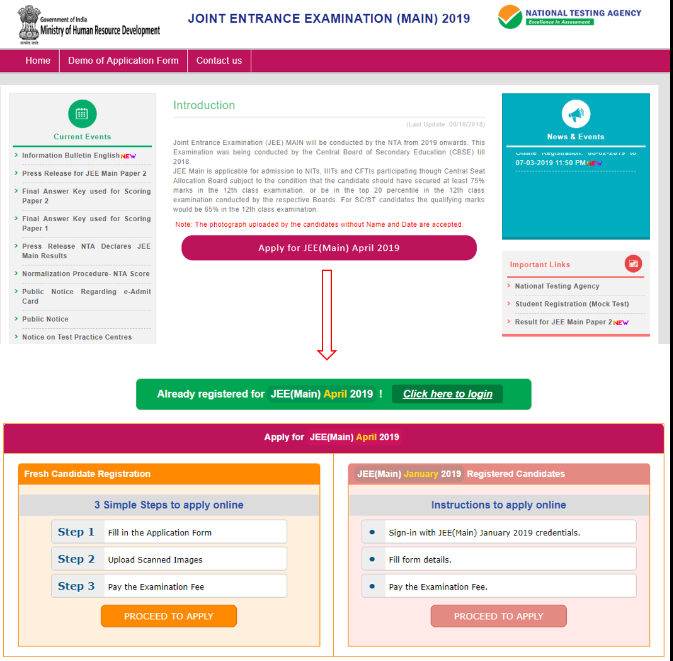 8th Feb 2019: The JEE Main Application Form for April Session has been released on the official website and the candidates who wish to appear for the April Session can visit the official website and apply online. Candidates must fill the application form within 7th March 2019, 11:30 PM. examination are filling up the online application multiple times. It is advised candidates to fill the application form only once and if the officials come across multiple applications, then the JEE Main application form for April session will be rejected. Candidates must have passed class 12 exam or equivalent. Students who are appearing for class 12 exam or equivalent in the academic year of 2019 can also apply. It is mandatory for candidates to study the following 5 subjects: -Language, 2-Physics, 3-Mathematics, 4-Any one of (Chemistry, Biology, Biotechnology, Technical Vocational Subject), 5-Any other subjects. Candidates can attempt JEE Mains exam for three consecutive years. Step 1: Visit the official website of JEE Main. Step 2: Click on the link “Apply for JEE Main”. Step 3: Now the page will be directed. Step 4: Enter all the required details in the registration form. Step 5: Click on the register. Step 6: Now JEE Main Registration for April Session is successful. Step 1: Login with the help of your credentials which you received while registering. Step 2: Click on the Application form for JEE Main April Session. Step 3: Now fill all the necessary details in the application form. Step 4: Upload the photographs & signature as mentioned in the application form. Step 5: Book your slot. Step 6: Process the application fee. Step 8: Take the printout of the acknowledgment page. Students can choose their date & time when they are comfortable to take the JEE Mains exam. Candidates can book their slot when they are filling up the JEE Main application form. JEE Main Maths: Sets, Relations and Functions, Complex Numbers, Quadratic Equations, Matrices and Determinants, Mathematical Induction, Sequences and Series, Permutations and Combinations, Limits, Continuity and Differentiability,, Applications of Binomial Theorem, Integral Calculus, Differential Equation, Vector Algebra, Trigonometry, Co-ordinate Geometry, Three Dimensional Geometry, Probability, Statistics, and Mathematical Reasoning. JEE Main Chemistry: Some Basic Concepts in Chemistry, States of Matter, Solid State, Liquid State: Properties of liquids, Gaseous State, Atomic Structure, Chemical Bonding and Molecular Structure, Covalent Bonding, Molecular Orbital, Chemical Thermodynamics, First law of thermodynamics, Solutions, Equilibrium, Equilibrium involving chemical processes, Redox Reactions and Electrochemistry. JEE Main Physics: Units and Measurement, Kinematics, Laws of Motion, Work, Energy and Power, Rotational Motion, Gravitation, Properties of Solids and Liquids, Thermodynamics, Kinetic Theory of Gases. Drawing and designing of geometrical or abstract shapes and patterns in pencil, Transformation of forms both 2 D and 3 D union, Elevations and 3 D views of objects Rotation, Development of surfaces and volumes, Generation of Plan, Creating 2D and 3D compositions using given shapes and forms, Sketching of activities from memory of urban scenes (public space, festivals, market, street scenes, recreational spaces monuments, etc. ), landscape (gardens, trees, riverfronts, jungles, plants etc.) and rural life. The first step towards JEE Main Preparation is to complete the entire Syllabus. Schedule Time Table: With the few days left for JEE Main examination, candidates are advised to schedule themselves with a strict time table and follow it regularly. Work on easy topics first and later move to difficult topics. Work on Previous Year Papers: Most of the questions which are asked in JEE Main will be derived from the pervious year JEE Main Papers. So candidates are advised to work on previous year JEE Main papers. Take Mock Tests: Once you have completed the syllabus, the candidates are advised to take mock tests, taking mock test help you analyze your preparation level and further you can work on them. Step 2: Login with the help of your credentials. Step 3: Now click on link JEE 2019 Admit Card. Step 5: Candidates are advised to check the details mentioned on the JEE Mains Admit card carefully. Step 6: Download your JEE Main Admit and keep it safe for future reference. The officials of NTA has released mock test for JEE on the official website. Students are advised to take this mock test to get an idea about how the questions will be raised in the JEE Mains examination. The officials have also launched a mobile app for mock tests. The JEE Main Result will be announced once the exams are over. Students can visit the official website in order to download their JEE Mains result from the official website. Along with the JEE Mains result, the officials will also release the merit list and those candidates whose name are mentioned in the merit list will be qualified. In the event of more number of days or more number of shifts, the candidates will be divided accordingly. This will ensure that there is no bias in the distribution of candidates who shall take the examination. Further, with a large population of examinees spread over the entire country the possibility of such bias becomes remote. Percentiles Scored separately for each of the three subjects (Mathematics, Physics, Chemistry) and the Total. What is the Percentile Score? Percentile Score is nothing but the percentage of the total number of students who appeared for the jee exam scored less than or equal to that particular percentile in that examination. How To Calculate the Percentile Score? How to Choose JEE Main Exam Centers For April 2019? Step 1: Visit the official website of JEE Main and fill up the application form for JEE Main examination. Step 2: While filling the Application form candidates should also fill their examination centers. Candidates can select up to 5 examination centers here. Step 3: Now candidates are requested to review their examination center and submit the application form. In order to participate in JEE Main 2019 Counselling, students must register themselves to JoSAA through online mode with the help of their registration number and security pin. Candidates must lock their choices in which institute they want to presume B.E/B.Tech Programme. Based on the candidates choice filling, the seat allotment will be done. Based on the availability of seat the candidates will be allotted seats. Freeze–If candidates are satisfied with the seat allotment and do not participate in further options. Float– If candidates need to upgrade their seat allotment. Slide– If candidates wish to upgrade the course in the same institute. Withdraw–If candidates have accepted the seat. Q1. What is JEE Main? A: JEE Main is a common entrance examination which acts as a gateway to admissions into various B.Tech/B.E programs. Q2. What is the eligibility criteria for JEE Mains 2019? Candidates can attempt JEE Main exam for three consecutive years. Q3. Which is tougher, the KVPY or the JEE Mains? A: The JEE Main is considered to be a little bit tougher when it is compared to KVPY. Q4. How can I apply for JEE Mains? Q5. What documents are required for JEE Mains? Stationery items ALLOWED for JEE Mains Paper II. Q6. When can I apply for JEE Main April 2019? A: The candidates who wish to appear for April attempt can fill the JEE Mains application form which will be released on 8th Feb of 2019. Q7. Is caste certificate required for JEE Mains? A: Yes, the candidates must produce the caste certificate while appearing for JEE Mains counseling. Q8. Can we get NIT through JEE mains? A: Candidates can secure admission in NIT based on their JEE Main ranks. Q9.What is the minimum marks to qualify in JEE Mains? A: The minimum qualifying marks for general candidates is 75% and the minimum marks to qualify in JEE mains exam for SC/ST/PwD is 65%. Q10. Will JEE Mains 2019 be online? A: Previously, the JEE Mains exam was conducted in both online and offline mode. But from the year of 2019, the JEE mains exam is conducted only in the online mode. Q11. Is JEE Mains 2019 online or offline? A: JEE Mains 2019 is conducted only in online mode. Q12. Will JEE Mains 2019 be conducted twice? A: Yes the JEE Mains 2019 exam will be conducted twice a year that is first attempt in the month of January and the second attempt in the month of April. Q13. How many times we can give JEE mains exam? A: Candidates can take JEE main exam for three consecutive years. Q14. How can I check my JEE Mains exam date? A: Once exam date link is activated, visit the official website and login with the help of your credentials. Now you will find exam date link, click on that link. Your exam date, shift will be displayed on the screen. Q15. How can i edit my JEE Application Form? Q16. Can we edit JEE Mains form 2019? A: Yes candidates can make necessary changes in their JEE Mains form 2019. Q17. When we will get JEE Mains Admit Card? A: The JEE Mains Admit Card for April session will be released on 18th March 2019 on the official website. Q18. Is Admit Card and Hall Ticket are same? A: Yes the admit card and hall ticket are same in JEE Mains. Q19. How can I download JEE Main Admit Card 2019? Step 1: Visit the official website of JEE Mains. Step 6: Download your JEE Mains Admit and keep it safe for future reference. Q 20. What is the date for JEE Mains 2019? A: The JEE Mains exam date for the April session is conducted from 6th April 2019. Q21. What is the use of JEE Main exam? A: The main use of JEE Main is that it acts as a gateway for admission into various B.E/B.Tech courses. Q22. What is the difference between JEE Main Paper 1 and Paper 2? A: JEE M.ain Paper 1 is for admissions into B.E or B.Tech courses and the JEE Main Paper 2 is for admission into B.Arch or B.Planning. Q23. Is AIEEE and JEE Mains Same? A: Yes AIEEE is same as the JEE. Previously the JEE Main exam is called as All India Engineering Entrance exam. Q24. What subjects are there in JEE Main Paper 1? Q25. Is JEE Main Syllabus is same as NCRET? A: Yes the most of concepts and questions are derived from the NCRET syllabus only. Q26. How many attempts are there in JEE Mains 2019? A: Candidate can take JEE Main 2019 exam twice in the academic year of 2019. Q27. What is the last date of JEE Mains 2019? A: The last date for JEE Mains 2019 April session is 7th March 2019. Q28. Is Aadhaar card mandatory for JEE Mains 2019? A: No Aadhar card is not mandatory for JEE Mains 2019 examination. Q29. Who will conduct JEE Mains 2019? A: NTA (National Testing Agency) Conducts JEE Mains 2019 exam. Q30. Are calculators allowed for JEE Mains? A: No calculators are allowed for JEE Main 2019 exam. Students can make use of virtual calculators which is arranged by the officials. Q31. Is watch allowed for JEE Mains? A: No candidate is allowed to wear digital watches to the examination hall. A: JEE Is known as Joint Entrance Examination which is a competitive entrance examination for admissions into B.E/B.Tech programmes. Q33. Can I give JEE Mains 3rd time? A: Yes, the candidate can take jee main exam for three times. Q 34. What is the JEE Main 2019 Photo Size to be uploaded for registration? Q35. What are the documents required while filling the JEE Main Application Form? Q36. What is Normalization in JEE Mains? A: The process of Normalization is an established practice for comparing candidate scores across multi-session papers and it is similar to those being adopted in other large educational selection tests conducted in India. Q37. How is Percentile calculated? A: Percentile Score of a Candidate = 100 x (Number of candidates who secured a raw score (or actual score) EQUAL TO OR LESS than the candidate) / (Total number of candidates who appeared in that session). Q38. What is the negative mark in JEE Main? A: The negative marking in JEE Main is as follows: For each incorrect answer, 1 mark will be deducted. For correct answer, 4 marks is awarded. Q39. What is CRL rank in JEE Main? A: The CRL represents the Common Rank List in JEE Main 2019. Q40. How to check the JEE Main 2019 Exam Center? A: Candidates can check their JEE Main exam center from their JEE Main Admit Card. Q41. What is JEE Main Counselling? A: JoSAA will conduct JEE Main Counselling & Seat Allotment for all the students who are qualified in the JEE Main Examination. Candidates must register themselves to JoSAA through online mode in order to participate in JEE Main Counselling 2019. Q42. How can I register for JEE Main Counselling? A: In order to participate in JEE Main 2019 Counselling, students must register themselves to JoSAA through online mode with the help of their registration number and security pin. Q43. When JEE Main Counselling will start? A: The JEE Main Counselling 2019 will be tentatively held on June 2019. Q44. What is the last date to fill the JEE Main Application Form? A: The last date to fill the JEE Main application form is 7th March 2019 and candidates must fill the application form within 11:30 Pm. Q45. Are calculators allowed in JEE Main? A: No, students are not allowed to bring calculators to the JEE Main exam hall. However, candidates can make use of virtual calculators available in the exam hall. We hope the detailed article on JEE Main 2019 for April is helpful. If you have any doubt regarding this article or JEE Main 2019, drop your comments in the comment section below and we will get back to you as soon as possible.